Ashok Chaturvedi is a visionary first generation entrepreneur and founder of Flex group of companies. The group has interests in flexible packaging solutions, biaxially oriented plastic films, chemicals, engineering, cylinders, holography & Foods. He is the chief architect of group's vision and value-driven business strategy; under his dynamic leadership the group has become a globally recognized player in the flexible packaging industry. What started off with a tiny manufacturing unit in 1983 is today a group with flourishing business ventures with turnover in excess of USD 1.5 bn and is set for a major strategic growth to position itself as the leading business conglomerate of India. In addition to plants in India the group today has 9 greenfield plants in 5 countries outside India i.e USA, Mexico, Poland, Egypt & Dubai and the products of the country are sold in 120 countries across the globe. To his customers Ashok has three promises - the 3 Q's - Quality, Quantity & Quickness and leading by example he has imbibed this in the culture of the organization. Globalization, excellence, modernization, quality and quantum growth are his guiding principles. Today Uflex Ltd, the flagship company of the group, has evolved into India's largest flexible packaging solution company serving fortune 100 companies not only in India but globally. 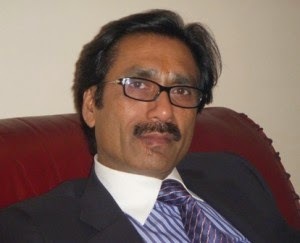 Ashok is a globally recognized exponent of flexible packaging industry and especially in India he is regarded as pioneer of flexible packaging, his eyes are constantly focused on innovation & value addition which the market will witness very soon and which will evolve the flexible packaging solutions to the next level. Ashok Chaturvedi is very passionate about the people pillar of business and holds a firm belief that it is this pillar which has been pivotal to the success of Flex till now and will take it to the next level. He is highly regarded for his constant emphasis on bettering the lives of people - be it employees, customers, business partners, shareholders or any other stakeholders - and responsiveness to change and continuous learning. An avid cricket lover he is very passionate about providing education and sports facilities to the underprivileged youth. His commitment to enhancing the quality of facilities in the country is seen in the promotion of an advanced Modern Cricket Club, and the contributions towards the growth of institutions for management studies. Ashok Chaturvedi is a widely traveled individual and has a strong conviction that all business leaders of today need to have a global mindset and outlook. He has been recipient of many awards & honors.